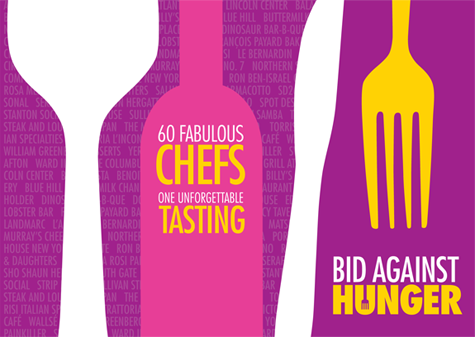 Tuesday night we returned to Bid Against Hunger, the annual charity event benefiting City Harvest. We had an awesome time last year, where we won at auction a package consisting of a cocktail class with Eben Klemm, a spread of caviar, and a private cooking lesson with Tom Colicchio. (We've actually yet to use those last two, but we finally scheduled the cooking class for a couple weeks from now, stay tuned.) This year's event was no less fun. While we didn't end up winning any of the bidding this year, I did bid up several items so I like to think I did my little part to help. Other than the auctions, the draw here is the excellent food from over 60 of the top restaurants in the city, along with stations pouring wine and cocktails, including Le Bernardin's sommelier extraordinaire Aldo Sohm pouring some truly delicious wines in the VIP room. The event raised over $1 million, not too shabby. If you want to get in on the action there are still some items still running in the online auction, auction runs until Nov 3rd I believe. I was too busy stuffing my face to take more than a couple token pics, but you can find lots at metromix or guest of a guest. Off the top of my head, among some of my favorite bites were Ripert's poached shrimp with foie gras, Le Cirque's Craig Hopson's escargot brochette skewers, short rib tacos from Stanton Social, a smoked trout on blini from Telepan, the luscious foie gras from Hudson Valley Foie Gras, sliced duck from Seäsonal, L'Artusi's lamb slider, SHO Shaun Hergatt's hamachi tartare, anyway, you get the picture. Good stuff. There were many more I don't recall, and more still I missed. It's impossible to even try half of the offerings there was so much good stuff. Here are my token pics. These are the guys from Sweet Afton served up pickled martinis and pickleback shots (although we had drank them out of whiskey for the picklebacks and were relegated to vodka for the last one of the night.) There was also a cocktail station from Ward III pouring old fashioned's and a tasty cucumber, vodka, and cocchi americano cocktail. I unfortunately neglected the painkiller table. This was the early scene before most people arrived, it got much busier but not so crowded that lines were a problem. This is the Hudson Valley Foie Gras's quite generous serving, topped with cured ham.